Lurching from one stale encounter to another with all the grace of a 65-year-old on their way home from a night on the town two months after a hip replacement operation, The Unexpected has been one of the most sense-bereft comics I've read this century. Featuring admittedly potentially interesting characters Neon and Firebrand and their quest for… something to do with the wildly dangerous and profoundly unstable Nth Metal Isotope that improbably came into existence at the end of issue 1 just when the pair of them needed something to do, this series has become a manic travelogue of the DC universe. We've had Slaughter Swamp and Blackhawk Island. In issue 3 it was Monster Valley; in issue 4 it was Gotham. (No sign of Batman. Mind you, Neon and Firebrand did arrive during the day…) This time around it's the Bavarian Alps and Castle Frankenstein where awaits Hawkman. 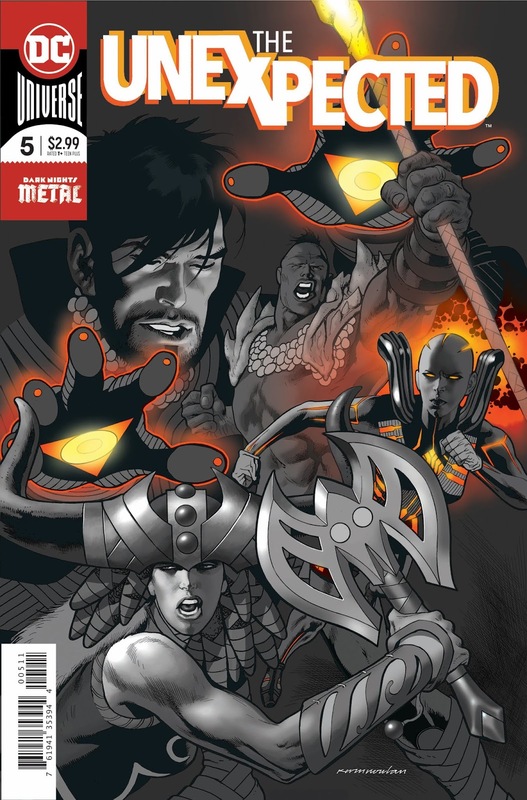 Who might, to be fair, actually know something about the incredibly dangerous Nth metal isotope which has existed for four issues and still hasn't exploded yet. One can but hope. Here's a review of issue 5, people! Ooh. That's a nice cover. Kevin Nowlan. Lovely. Oh, Steve Orlando, you're such a tease. There are Neon and Firebrand meeting Hawkman for the first time, getting ready to ask for his help with the whole Nth metal isotope thing when, wouldn't you know it, the pesky plot device starts mucking about with Hawkman's mace and the poor guy ends up having weird visions of the Dark Multiverse which send him loopy and the three of them have to sort out their differences via the ancient art of tiddlywinks. No. I'm kidding. They have a fight. Cue Neon warning about the dangers of fighting around the Nth Metal Isotope because it might explode. (It hasn't the last four times there's been a fight, but I'm sure it will eventually. Any time now…) Cue Firebrand ignoring Neon (because fighting's what she's all about, naturally) and then Neon doing something completely ridiculous (in this instance, transforming the emotional energy of anger into the much less "toxic" energy of hope. Awww) to end a fight that was about as entertaining as it was… ahem… unexpected. Fortunately, the rest of the issue's (a bit) better, if you can stomach the accompanying nonsense. The notion of the isotope being psycho-reactive is interesting; the notion of Quench being 'born' in a ritual that is the precise opposite of the one that gave Neon his powers and purpose is similarly interesting. The infodump in Frankenstein's laboratory is also interesting. The problem is that Orlando is doing here what he always does. Characters blurt out their discoveries to one another in moments of stress or epiphany, but they speak in a technical language which, most of the time, itself needs explaining. What you're left with is an overly verbose text which obscures the story rather than illuminating it. Perhaps conscious of the more esoteric and metaphysical aspects of the story which do need to be explained, Orlando relies on these expositions to try and keep the reader up to speed, but he's also clearly aware of the importance of keeping the narrative moving and it seems to me that clarity gets sacrificed along the way. Nor are the implications of some of the more outlandish explanations explored. What does it mean that the Nth metal isotope doesn't "come from one of the multiverse's positive-matter worlds" but instead has originated somewhere "outside the multiverse" – particularly when we all saw it come into existence on this Earth in issue 1? Why on Earth (any one of them, positive or negative) does no one at DC think it might be an idea to at least give some indication of who Mandrakk is? Why would Victor Frankenstein have built a machine that's able to analyze the Nth Metal isotope? Why, at this point, am I even trying to understand these things? 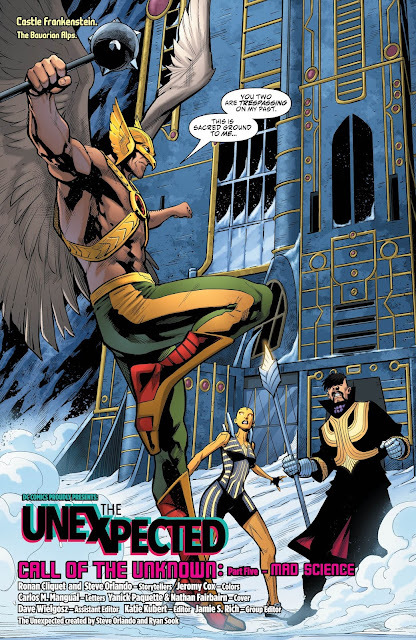 On the plus side, Orlando's characterization of Hawkman this issue is better than that of Huntress and The Signal in issue 4. 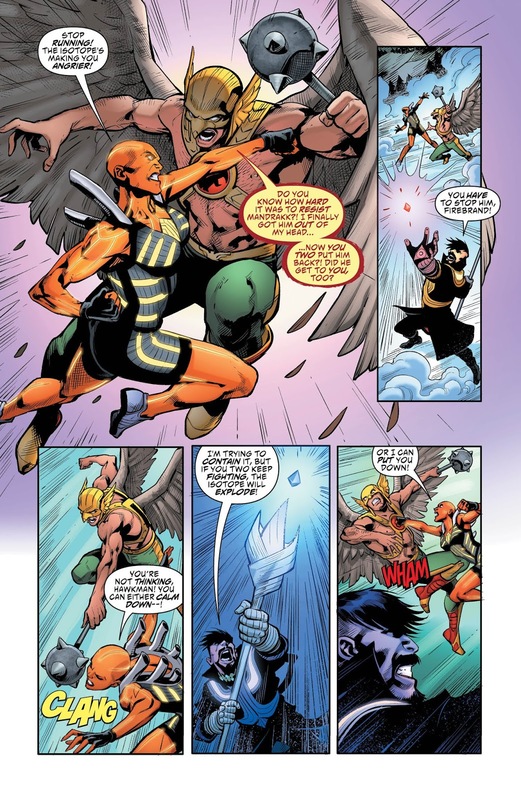 Hawkman comes across as an engaging, knowledgeable figure, although, as with every other character in this title to date, his tendency to spout hyper-dramatic jargon renders him less human than he could be. 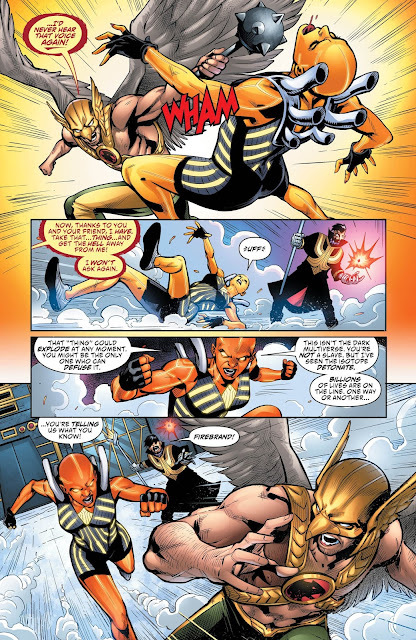 Onimar Synn, of course, shows up in the second half of the comic as he has done every issue since issue 3. This time around feels more impressive, though – perhaps because he isn't handily avoided or 'sent away' by Neon. Instead, Orlando gives us a genuine cliffhanger that, I must admit, improves the overall enjoyability of the issue. The art by Ronan Cliquet works here, too. I'm still missing Ryan Sook, but the double-page spread just before the cliffhanger ending is pretty tasty, and some of the design work for Frankenstein's castle is rather nice too. This doesn't prevent me, however, from feeling the same sense of vague bewilderment I've felt with every issue since #2. Well, The Unexpected keeps rolling on. There are revelations in this issue which are probably meant to be exciting and dramatic but feel flat and uninteresting, perhaps because what's at stake is never really clear and seems to be far too abstract for me to care about. To be fair, this issue's cliffhanger might change that and if it does I'll be pleased. 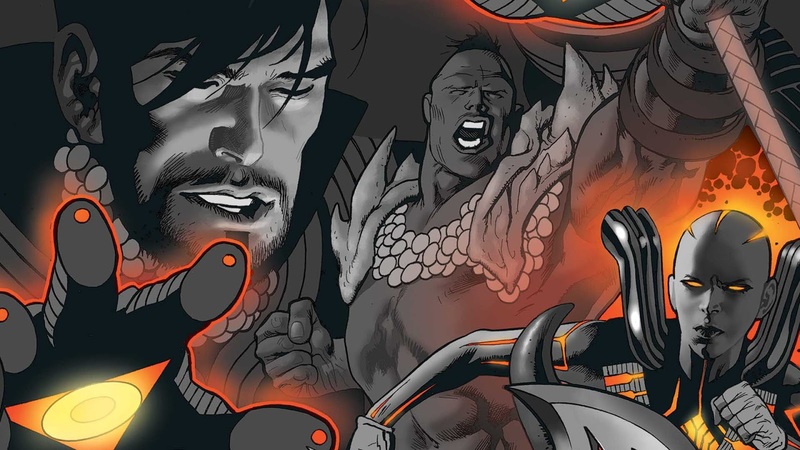 This fifth issue sees the fourth penciller to grace the title which is as clear an indication as one could wish for that DC doesn't really care about it. I'm afraid I really can't bring myself to be upset about that.